On March 11, when the magnitude 9.0 earthquake rocked the northeastern coast of Japan, most people on the island of Oshima scrambled for higher ground while fisherman 68-year-old Susumu Sugawara jumped into Sunflower, his trusty fishing boat of 42 years, and headed out deep to sea to meet the giant waves head-on. As he passed the fishermaen’s abalone boats, Sugawara waved good-bye, apologizing that he couldn’t save them all, though he had no way of knowing if he’d even be able to save himself from nature’s devastating fury. When the first wave rolled towards him, Sugawara was stunned by the magnitude of this wave. Many times he’d encountered 16 foot waves but this one was at least four times that size. Others from Oshima attempted the same incredible feat in their boats, but none are known to have survived. Eventually Sugawara found himself carefully navigating back to his devastated island in total darkness with the fires raging in the town of Kesunnuma three miles away as his only guide. From that day on and for twenty days, Sugawara and Sunflower made hourly trips to the mainland. According to CNN, the pair were the only salvation to the mainland for the first two weeks following the catastrophe. Without them, Oshima would have been completely cut off. Sugawara doesn’t ask his passengers for money if they have none. For those who can afford to chip in, he only asked for $3.50 for fuel. 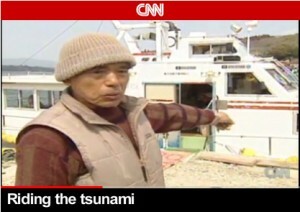 Tadaomi Sasahara, owner of Oshima’s supermarket, told CNN that he gave away all the food in his store. Islanders, he said, shared what food they had in their homes with each other. Sasahara now makes runs to the mainland with Sugawara and Sunflower. From great tragedy often comes great heroism, and Sugawara and Sunflower will certainly be remembered among the heroes of what was one of Japan’s darkest hours. How do you face unexpected tragedy when it strikes? Will you face it head on and help others, or will you complain or run away? Let’s all be inspired by this brave and selfless fisherman to think of the common good instead of ourselves! This video is from CNN, broadcast Sunday, April 3, 2011. 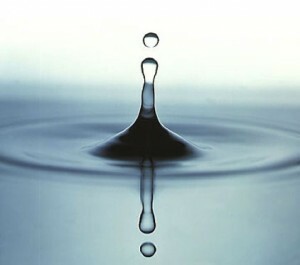 Below is a special message from renowned Japanese scientist, Dr. Masaru Emoto, who brought attention to the power of thought/prayer on water crystals. He has a special request for assistance tomorrow noon (March 31, 2011). If this message resonates with you, please lend your intentions also. Remember to center and ground and set the intention for the highest good. By the massive earthquakes of magnitude 9 and surreal massive tsunamis, more than 10,000 people are still missing…even now… It has been 16 days already since the disaster happened. What makes it worse is that water at the reactors of Fukushima nuclear plants started to leak, and it’s contaminating the ocean, air and water molecules of the surrounding areas. I would like to ask all people, not just in Japan, but all around the world to please help us to find a way out the crisis of this planet. Please say it aloud or in your mind. Repeat it three times as you put your hands together in a prayer position. 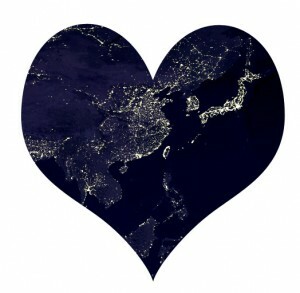 The images and stories from Japan have moved the Chopra Center to set up a powerful meditation to help the courageous people in Japan. On Monday, March 21 – join Deepak as he guides us in a powerful meditation, sending our collective love and healing energy to those affected by the recent and ongoing tragic events in Japan. The meditation will begin at 8:30 p.m. (Eastern), 7:30 p.m. (Central), and 5:30 p.m. (Pacific). To join in this global healing meditation broadcasted live, click here. Our individual intentions truly do make a difference. Collectively, we can make a world of difference. Join us in uniting our intentions for our friends in Japan . . . This rabbit recently hopped over to the city of Dezhou, in Shandong Province, to partake in some Earth Day festivities with a few friends. While there, I learned more about the greening of China and the significant role Dezhou plays in this cleantech movement. The future certainly looks bright for 德州! Did you know that Dezhou is one of the leading global players in solar technology today? The city boasts a thriving research and development, manufacturing, and tourism center and those in the renewable industry often refer to Dezhou as China’s Solar Valley. The Chinese government has supported the cleantech movement in this region through preferential tax benefits and other various policies that helped attract top firms to Dezhou. In just a few short years, China has become the leading manufacturer of wind turbines and solar panels around the world. It appears China has really stepped up in a significant way to promote sustainable technology. According to the Chinese Renewable Energy Industries Association (CREIA), there were 1.12 million renewable energy jobs in China, as of 2008; the association believes more than 100,000 new jobs will be added each year in China going forward. 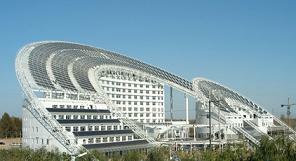 The solar industry in China is very robust and is currently experiencing a growth rate of nearly 30 percent a year. It is China’s stated goal to have 8 percent of their electricity generation come from solar, biomass, and wind by the year 2020. The government plans to subsidize renewables to the tune of $450 billion over the next five years to help meet this goal. Do something for the Earth today! Recycle, turn off lights, carpool, … – every little bit counts! What have you done for the Earth lately? Ah, spring is now upon us, and this rabbit enjoys the greenery all around; it is a time for rebirth! In Shanghai, one of the most iconic symbols of the city—The Bund—experienced a rebirth of its own. 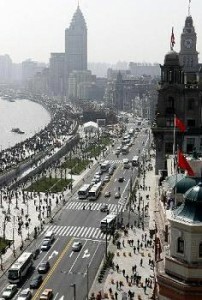 On March 28th, after nearly three years of renovations, the Bund reopened to the public. On that Sunday, scores of locals and tourists alike took their first stroll along the renovated 2,000-meter riverside promenade. The project wrapped up just in time for the 2010 Shanghai Expo. Visitors will surely experience a more functional Bund as they marvel at the aesthetic buildings built in the early 20th century. This certainly is not a cheap venture either; the restoration is part of Shanghai’s overall RMB 300 billion World Expo investment. Area for public activities increased by roughly 40 percent; the Bund can now accommodate up to 800,000 visitors on peak days. Six-lane tunnel built beneath the Bund to mitigate traffic congestion on surface streets. Improvements to the public transport network and the flood-control infrastructure. Tree plantings along the banks of the river and installation of 2,000 park benches. This dragon figures it’s time to brush up on the home country so began digging on the Internet in America (where the Internet remains mostly uncensored, even to dragons)! Though written for college students, check out this great resource on China: 50 Lectures to Learn about the Past, Present, and Future of China. Got a greater understanding about what makes China tick! Even this Chinese dragon learned a lot from this resource! So what’s your favorite resource for news on Asia? And how do you feel about Google getting out of China? How do you feel this decision will impact the Internet world? This dragon applauds the stand Google is taking over censorship and hacking in China. This is what Google said in their recent blog (yeah to the power of blogging)! This dragon is especially shocked by the possibility that the Chinese government might have been hacked into Google to monitor the email accounts of human-rights activists. What would it truly be telling the world if the Chinese government resists Google’s demands for an impartial search engine, or if the implied accusations against the government that it hacked into Google are true? 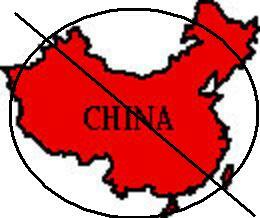 “We will be issuing a formal demarche to the Chinese government in Beijing on this issue in the coming days, probably early this week. It will express our concern for this incident and request information from China as to an explanation of how it happened and what they plan to do about it,” State Department spokesman P.J. Crowley told reporters. Google is in a tough place. It knows that bad things are happening to its service in China (such as hacking and censorship), and it thinks it may have to pull out of China. But is that the right thing to do? What do you think?